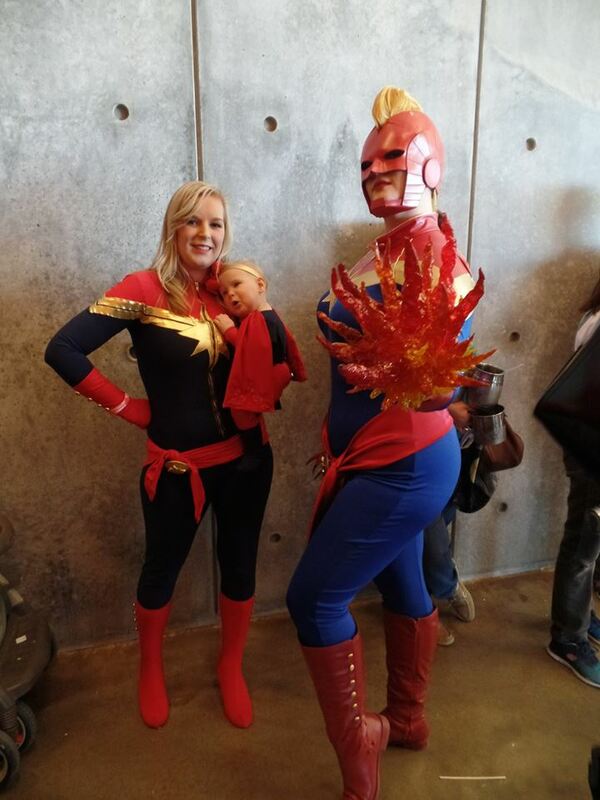 Ran into my friend Rachel, who also dressed as Captain Marvel and dressed her daughter up as Ms. Marvel! Photo by Gone Catawampus. 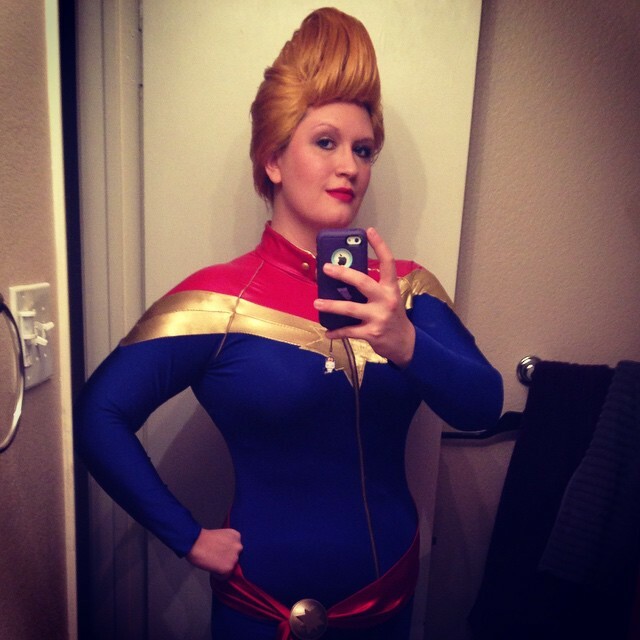 Why This Costume: I really got into Captain Marvel last year. It started with my Ms. Marvel stashbusting. The more I read about Carol, the more I liked her. I was smitten with Kelley Sue Deconnick’s comic from the first issue I picked up. Since I was late to the game, I barreled through the 2012 run thanks to the digital trades and then jumped straight into the 2014 run. This is one of my favorite comics and always makes it on my pull list. I did a short interview with RedBeard TV, who was one of the judges. Check it out here. Photo by Rick on Facebook. 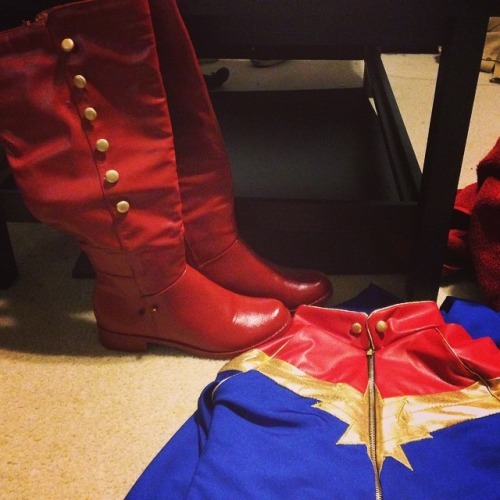 How I made it: Let’s start with the first item I made on this costume: the bodysuit. I came up with the pattern for the suit the same way I do all my superhero suits. After blending a raglan sleeve skating pattern with a leggings pattern (in hindsight, I think it would have been easier to use Kwik Sew 3052 and draw in the raglan lines and side seams), I made a mock-up, tweaked the fit, and marked all the stripes on the base suit. 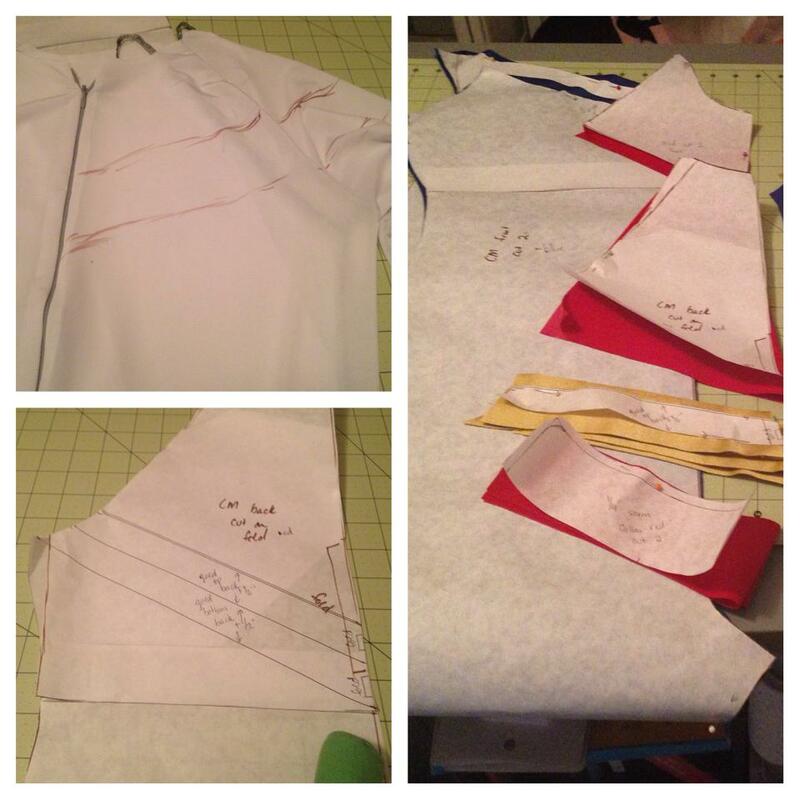 I then cut up my mock-up and transferred all my markings to paper, evening up the lines and adding in seam allowance. I wanted a suit that looked like it could actually be worn in space, so I spent a lot of time hunting down material. Ultimately, I decided on this faux stretch leather, gold metallic spandex, and a football weight royal blue spandex. Probably my favorite photo from the con. I didn’t run into my friends who dressed as rapotrs, but I did run into Raptor Jesus! He was a good sport about this. Photo by Gone Catawampus. There’s really not a lot to say about constructing the suit that I haven’t mentioned in my Spandex 101 series. One of the most difficult things with this suit is matching up the stripes while dealing with the piping (I opted for flat piping, by the way. I liked the look better). I wound up machine basting the piping to one piece, then hand basting the other side, then machine basting again before running it all through my serger. Spandex likes to slide around, and even being off 1/4″ was really obvious. I will not admit how much time I spent seam ripping :P.
Bodysuit after seam-ripping at least 3 times. The sash was pretty simple. 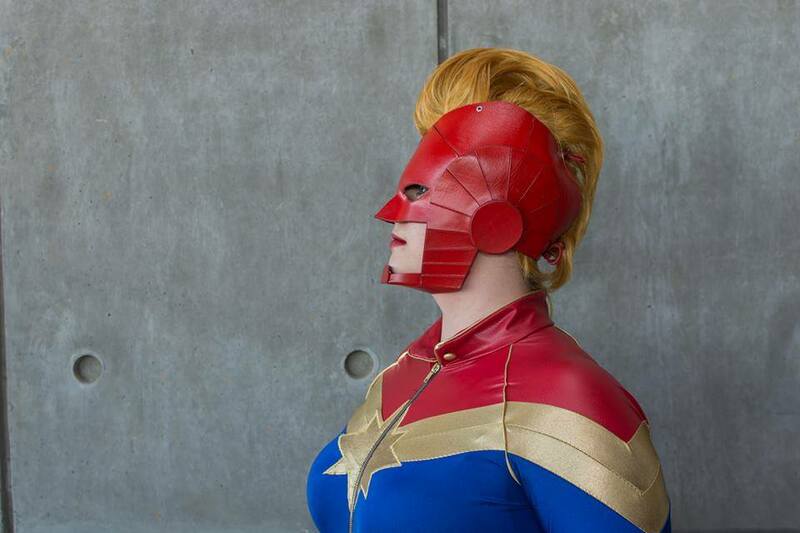 I just made a rectangle out of the same stretch satin I used for my Ms. Marvel and tapered off the edges with my hip curve. 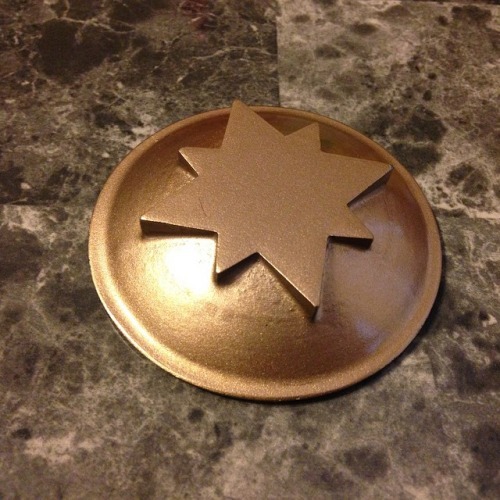 The lovely hip ornament was 3D printed for me by Chaks Productions. I attached it with a spin clip. For the boots, I bought a pair of faux leather tan ones off of eBay, cut off the decorations, and painted them with Angelus leather paint. The paint didn’t take to the zipper, so I had to seam rip the original ones out and stitch new ones in. 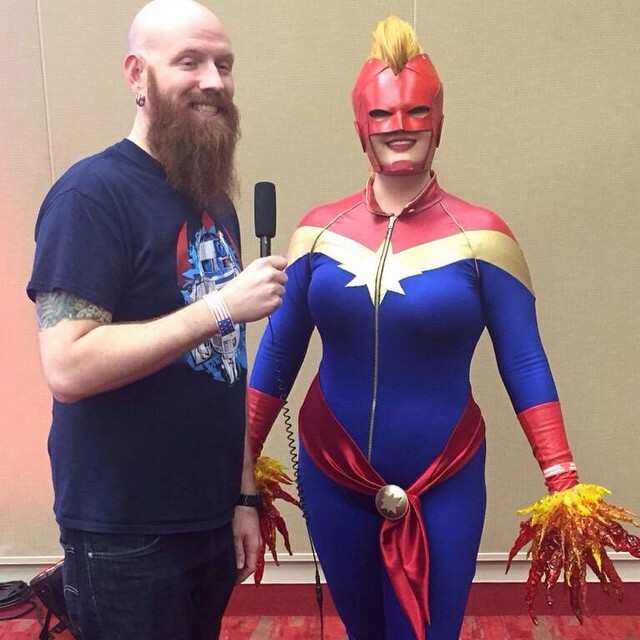 Cosplay is serious business, dudes. Photo by Gone Catawampus. 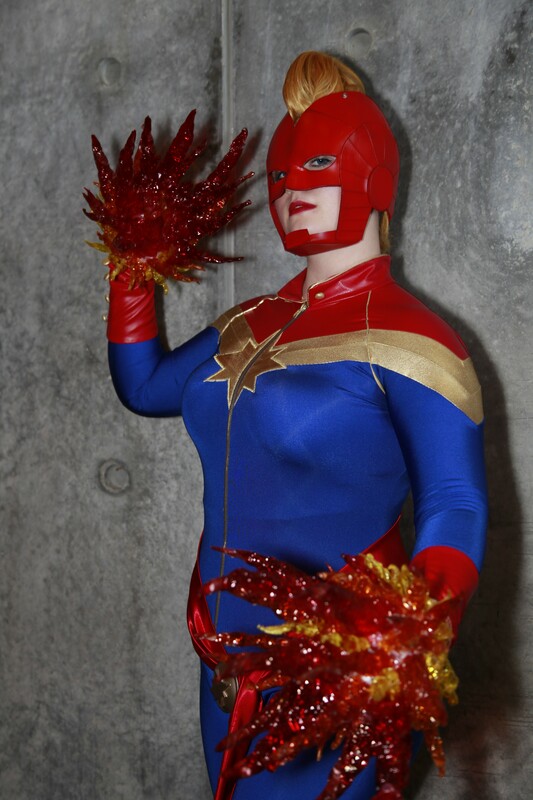 The gloves were definitely the most expensive part of this costume. My original plans to make gloves didn’t go so well, so I decided to purchase some. I bought a pair off of eBay that matched my boots quite well, even if they did come from a China-based company. Unfortunately, my dog got into my craft room and destroyed those. I ordered another pair, but they were orange. Gloves number three was the ultimate winner. A moment of silence for the gloves that were destroyed. I wanted the buttons to match the suit, so I used the DIY fabric covered button kits from Jo-Anns. I picked up several 5/8″ sets and covered them with scrap spandex. 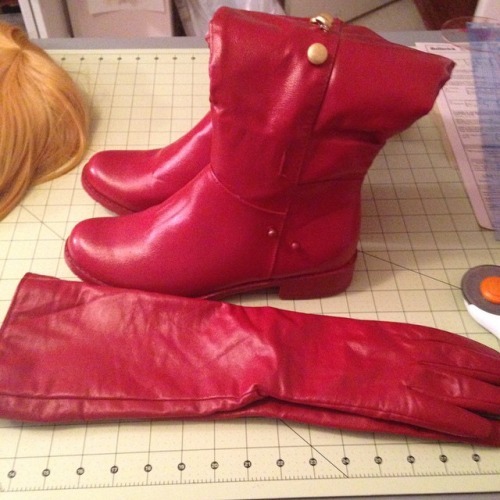 Once that was done, I hand sewed them to the collar, the boots, and gloves. Hold on, dudes. Rocket’s trying to sell Chewie again. Photo by Gone Catawampus. The flame fists were fun to make. I used the lovely BelleChere’s tutorial. Basically, you make a sphere out of masking tape. 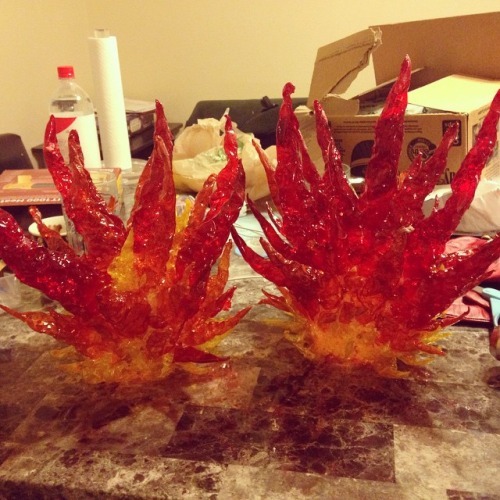 The “flames” are cones of theatre lighting gel that I melted down with my heat gun. I hot glued the cones to the sphere. They’re remarkably sturdy and survived getting run into by con-goers and people trying to touch them. The mohawk was also a lot of fun to style! I picked up a Lulu from Arda for this. I was hoping to snag a lace-front, but they were out of the color I needed. To style it, I teased a strip down the center of the wig. 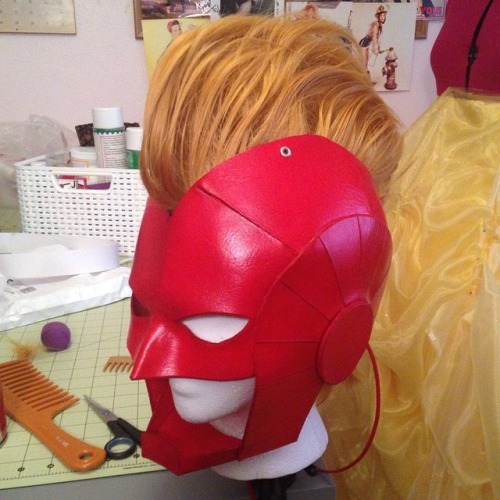 Then, I molded extra wefts around the teased base with hair spray and my blow dryer. It’s a very similar to styling anime girl bangs, just in a different direction. 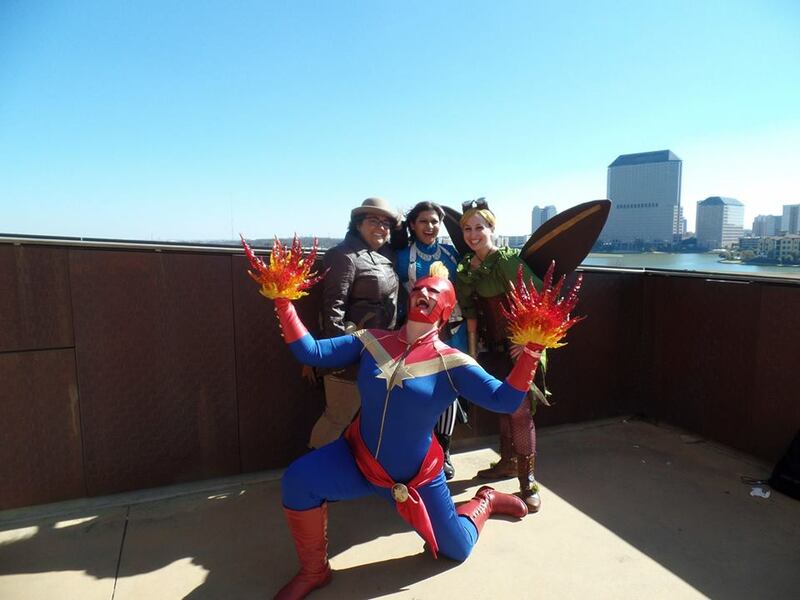 It held up surprisingly well, in spite of some nasty wind at the con. The gorgeous helmet was made by Kevin Dale. If you need any leather pieces, talk to this guy. His work is phenomenal. 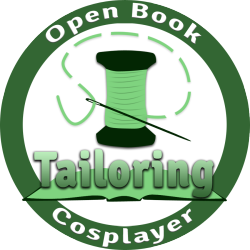 It has eyelets at the top and I threaded cord through the wig to hold it in place. I mentioned in a previous post that I have a couple of different looks depending on what cons I wear this costume to. I also have a lace front alternative wig from Epic for days I don’t want to wear the helmet. I also drafted a faux fur collar for my bomber jacket for cold weather cons. Thoughts on this costume: Overall, I’m really pleased with this costume. It was much harder than I expected, but I’m glad I took my time with it. There are still a few small tweaks I’d like to make, but none of them are major. I can’t wait to set up a proper photo shoot with this costume! Hopefully at one of the air museums near me. *insert all the Heart Eyes here* I reallllly love the blasters! I think it just adds an extra touch to it! Haha, thanks! It was a fun challenge. The judges really liked it! Gorgeous! I’m very jealous of your sewing skills! It all turned out fantastic!! That looks realy amazing. Congratulations on the award. You really deserved it. It’s a spectacular costume. Congrats on a very well-deserved award. The last photo reminds me a little of some depictions of Athena, with the mohawk standing in for the crest of her helmet. Very powerful image. Your costume is impressive. I love all the details, from the suit to the helmet. I’m sorry about the first pair of gloves. We pet owners know how these things are. Thank you! I’ve definitely kept a closer eye on him around my costume stuff and try to keep it higher out of reach. Lesson learned! Thanks, Cate! I debated on making them initially, but I’m ultimately glad I did. Definitely gave the costume an extra pop! 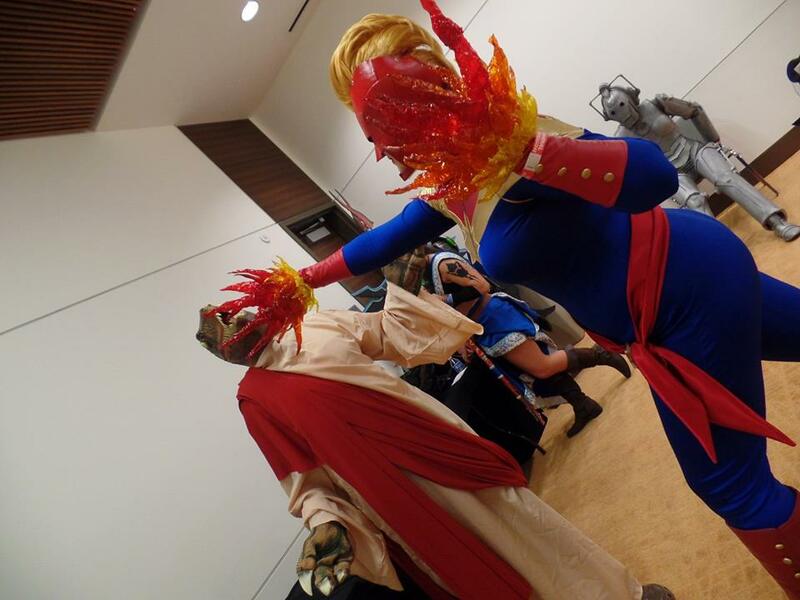 I LOVE your Ms. Marvel costumes! This one is super amazing! AH!!! This is spectacular! Your award is well earned! Your costume looks absolutely stunning!! 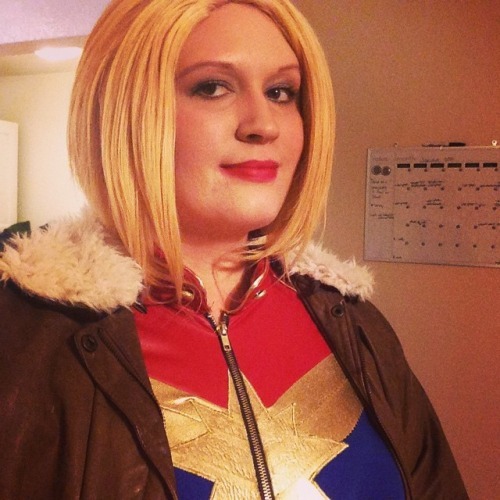 I’ll be cosplaying Captain Marvel soon and helpful hints have certainly led me in the right direction. 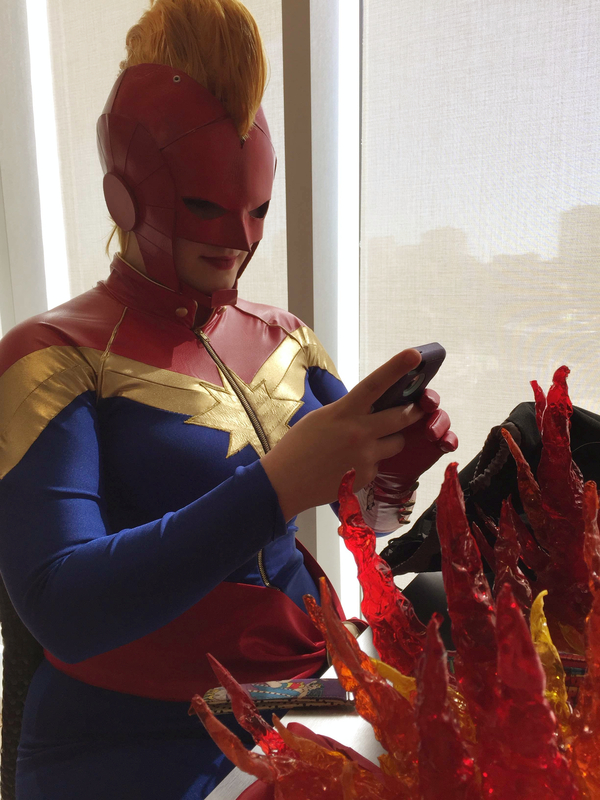 Thank you so much for posting this, there isn’t a whole lot of Carol Danvers stuff out there and it’s kind of sad. I’m doing pretty well on the progress but I’m still trying to figure out how to do the flames of energy since I have never worked with theater gel before.